Checking for doneness on a piece of meat or ensuring that sugar has reached the right temperature for candy-making involves more than just guesswork. Accuracy is key to properly preparing these foods, and for that, you need the right thermometer for the job. Beyond the temperature of foods, thermometers can also give you a true indication of the inside of your oven, refrigerator, and freezer. Your appliance's built-in gauge may be inaccurate (ovens are notorious culprits); a thermometer will give you peace of mind that your cold food will stay cold and your cakes will bake evenly. The instant-read thermometer is a probe thermometer, available in both analog and digital styles, that allows a cook to take instant temperature readings of a food. They're great for testing the doneness of a piece of meat or poultry while it cooks, but they're not meant to be left in during cooking. You simply insert the probe into the food, check the temperature, and then remove it. Instant-read thermometers also can be used to measure the temperature of hot food in a steam tray or chafing dish, as well as cold items in a salad bar, and to measure how quickly a soup or sauce is cooling (to ensure that it does not spend excessive time in the temperature danger zone). A meat thermometer is similar to an instant-read, but it sports a larger dial (on the analog types) to make them easier to read. 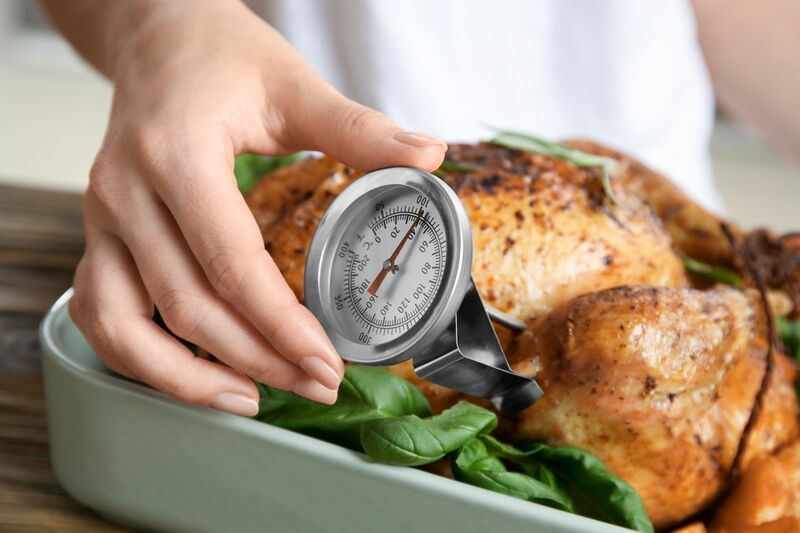 The main difference is that unlike an instant-read thermometer, a meat thermometer is inserted into a joint of meat or a whole chicken (or turkey), where it remains throughout the roasting process. To monitor the temperature, you simply peek at the dial. Digital versions are more sophisticated. They can be programmed to emit a beep to signal that your desired target temperature has been reached. In this case, the probe is situated at the end of a long, oven-proof wire that is attached to the unit itself, which can usually be fixed to the outside of the oven with a magnet. You can even leave the probe in the meat after you take it out of the oven, to monitor the meat's temperature while you rest it. Candy and deep-frying thermometers are made of glass and are used for measuring much hotter temperatures. Whereas meat and poultry might be cooked anywhere from 130 F to 175 F, candy involves cooking sugar as high as 300 F, and deep-frying requires oil to be 375 F and hotter. You can get separate candy and deep-frying thermometers, but usually, they are combined, and they work fine for the home cook. Typically, they have a clip that you can use to secure the thermometer to the lip of your pot, along with a guide showing the temperature levels for each food. Why it matters: In confectionary, your sugar needs to hit just the right temperature, neither too cool nor too hot, to achieve the proper consistency for the type of candy you're making. Similarly, depending on what you're frying and what type of oil you're using, if it's too cool the item can turn out greasy, and if it's too hot the oil can start to smoke and even ignite. Oven dials are not a reliable measure of the real temperature inside your oven. When you set your oven to 350 F or 400 F, it could be anywhere from 25 to 50 degrees higher or lower than that. Even worse, your oven might have hot spots or cool spots—regions where the temperature is consistently higher or lower than other parts of the oven interior —which can affect baking times. To find out, get yourself an oven thermometer, which you can place on the shelf (or hang by a hook from one of the oven racks). When you set your oven to 350 F, the thermometer will tell you whether it's actually at that temperature or not. Some amount of fluctuation is normal but if you find that your oven consistently reads 25 degrees hotter than what you set it to, you can adjust the temperature accordingly. No more blackened cookies! What Is an Instant-Read Thermometer? What's Keeping Your Cooler Cool?